The keynote of the fifth General Meeting will be the vital contribution of VLBI to the future of global observing systems under the theme of "Measuring the Future". VLBI is a key technique for realizing the global reference frames and studying global change by monitoring the full set of Earth orientation parameters (polar motion, dUT1, celestial pole). Required accuracy levels and long-term stability can only be guaranteed with a rejuvenated VLBI system. Keynote speakers will be asked to address the keynote in their presentations. 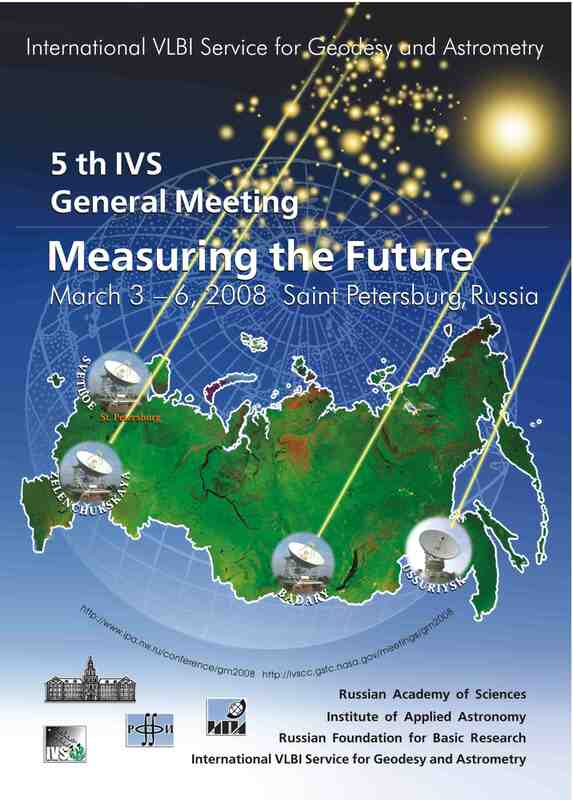 The meeting will be held in St. Petersburg, Russia and will be hosted by the Institute of Applied Astronomy (IAA), Russian Academy of Sciences (RAS). The institute is located on the Neva river at 10 Kutuzov Quay (Naberezhnaya Kutuzova). The icebreaker reception (Sunday, 19:00–20:30) and the Banquet dinner (Wednesday, 19:00–22:00) will both take place at the Palace of Scientists (different entrances) located at 26 Dvortsovaya nab. Find both venues in a map of the area. Registration will be open on Sunday 14:00–17:00 at IAA. Internet access during the General Meeting will be available on 3–4 terminals set up in a special area of the Institute of Applied Astronomy. There is no wireless Internet access at IAA. Accommodation will be handled by the Saint-Petersburg-based tourist company OASIS Travel & Congress Services. A corresponding application form plus instructions can be downloaded at the IAA's meeting Web page. A copy is also available here in PDF format and in Word format. The filled out form needs to be submitted to OASIS (by fax or e-mail) on or before December 21, 2007 by international participants and on or before February 1, 2008 by Russian participants. The accommodation deadline for international participants had been extended to January 11, 2008. Registration and visa invitations are handled by the Institute of Applied Astronomy. Please visit IAA's meeting Web page for the submittal form plus instructions and the current list of registered participants. A copy of the submittal form is also available here in PDF format and in Word format. The deadline for registering is February 1, 2008. Still, as visa procedures for international participants can take one to two months, the combined deadline with requests for visa invitation letters was December 21, 2007. The deadline for visa requests had been extended to January 11, 2008. The registration fee is 6250 RUB (~$250 US) payable at the meeting. Payment can be accepted in Russian rubles (RUB) in cash only. The fee covers conference materials, conference dinner, and coffee breaks. Please visit the IAA meeting Web page to see the current list of registered participants. Book of abstracts: PDF format (A4, 45 pages, 417 KB), Word format (A5, 90 pages, 719 KB). Hard copies of the final program and book of abstracts will be provided to particpants at the meeting. 1 VLBI - A Vital Player in Global Observing Systems The outstanding VLBI results available today are valuable for various fields of science and research and are needed for many practical applications. Due to its unique features VLBI plays a key role in the maintenance of precise global reference frames, TRF and CRF, and in the provision of all Earth Orientation Parameters. The contributions of VLBI comprising developments in the observation, data handling and results to the Global Geodetic Observing System (GGOS) of the IAG (International Association of Geodesy) and to multi-disciplinary research will be demonstrated. The close link of VLBI to topics of the IAU (International Astronomical Union) and its relation to other space geodetic techniques will also be shown. The current activities to meet future demands requested in the ‘VLBI 2010 Report’ and in the ‘GGOS 2020 Reference Document’ will be summarized. 2 Network Stations, Operation Centers, Correlators This session focuses on the recent activities and future plans at VLBI networks, stations and correlators. Presentations about issues that relate to improving VLBI data quality in general and more particularly with regard to "VLBI2010" are solicited. Also welcome are submissions concerning the GGOS Project's contributions to local surveys to determine the spacial vectors from the radio telescopes to co-located geodetic instruments. Network station status reports should be submitted to this session, but should be presented as poster papers. 3 VLBI Data Structure, Analysis Strategies and Software IVS data are collected at the IVS Data Centers and analyzed by the IVS Analysis Centers. In this session we call for contributions related to the IVS Data and Analysis Centers' activities. We expect from the IVS Data Centers contributions concerning data flow, services for users, reliability and timeliness of data exchange between the primary Data Centers. IVS Analysis Centers are invited to contribute papers related to their current activities, development and comparison of models and software used for the data analysis, and assessment of the errors and accuracy of the VLBI results. Presentations related to the comparison and development of analysis strategies are especially welcome. 4 Interpretation of VLBI Results in Geodesy, Astrometry and Geophysics The analysis of VLBI observations produces time series, long-term average positions and rates, and values of physical parameters. Suggested topics include the use of such VLBI results in modeling geophysical fluids from the atmosphere to the core, nutation/precession, high frequency Earth orientation changes, refinement of the terrestrial and celestial reference frames, interpretation of the motions of specific sites and radio sources, astrophysical investigations, tests of relativity, and other scientific uses of geodetic and astrometric VLBI data. Also included are investigations of the troposphere and the ionosphere by VLBI. Another area is the comparison, validation and combination of VLBI with other space geodetic techniques, and the integration of the techniques within the framework of IAG's Global Geodetic Observing System (GGOS). 5 Progress in Technology Development and the Next Generation VLBI System It is now over two years since the final report of WG3, entitled "VLBI2010: Current and Future Requirements for Geodetic VLBI Systems", was completed. Since then, intense effort has been expended toward the definition of the next generation VLBI system. This work has been carried out in the areas of system/network studies, subsystem specification, prototyping, proof-of-concept tests, and enhancements of the network (e.g. new sites and antennas), among others. Contributions are solicited that will report efforts to date in these areas or plans to bring the next generation VLBI system closer to reality. The convenors and Program Committee are reviewing all contributed paper submissions. Please note that we may not be able to accept all submissions due to the time and space limitations, and we may have to change whether a paper has an oral or poster presentation. Presentation equipment will include a PC projector (plus laptop), one overhead projector (if needed), and a laser pointer. Papers presented at the General Meeting will be published in a volume of Proceedings. The proceedings volume will be printed in the Russian "Science" series as a hardcover book (similar to the Proceedings of the IAU General Assembly). Authors must follow the instructions for manuscript submission. The deadline for submission of files for publication is April 15, 2008. Weather. Compared to some other places on the same high latitude St. Petersburg’s climate is relatively mild, as it benefits from some of the warming affects of Atlantic cyclones. Statistically January and February are the coldest months, and snow as late as April is possible. St. Petersburg is a windy city, and the chill factor caused by prevailing winds from the Baltic Sea in the winter months can be particularly fierce with temperatures plummeting to the –30°C (–22°F). In March the average high temperature is around freezing (0°C, 32°F). So, don't forget to bring your coat, gloves, and hat. Time. St. Petersburg uses Moscow time, which is three hours ahead of Universal Time during winter (Moscow time = UTC + 3 hrs). Arriving in St. Petersburg. International flights arrive at Pulkovo Airport at the international terminal called Pulkovo 2. The airport is located about 17 km (10.5 miles) south of the city center. There are several options to get form the airport to the city center (e.g., see the airport transportation page). For your convenience, however, the LOC is organizing an airport pick-up for all participants of the General Meeting using their institute buses. In order to organize the pick-up the LOC requests that you provide your arrival information (date and time of arrival, airline, flight number). For that, please fill out the Arrival and Lunch form and e-mail it to the LOC (ivs-gm5@ipa.nw.ru). In case you intend to make your own arrangements, please indicate this as well. Pulkovo 2 also offers banking services and it may be a good idea to get some cash here. Services consist of a currency exchange office (check the opening hours), an ATM (bank-o-mat), and automatic currency exchange machines. The latter two are to be found on the ground floor of the arrival and departure halls. Money matters. Russia's official currency is the Ruble (also Rouble). The denominations in circulation are coins of 1, 5, 10, and 50 kopeks and 1, 2, and 5 rubles; and notes of 5, 10, 50, 100, 500, 1000, and 5000 rubles. You can obtain rubles by changing US dollar or Euro at an exchange office, using your debit (bank) card or credit card at an ATM, or cashing traveler's cheques. The latter, however, is no longer the cheapest or most convenient way to carry funds. An original passport (not a copy) is required at the majority of exchange offices. Automatic Teller Machines ("bank-o-mats") are frequently found in hotels and in or around large stores. Their menu systems usually have an English language option. Make sure that you have a personal identification number (PIN) that's designed to work overseas; your bank will be able to advise on this. Language. The official language of the Russian Federation is Russian. English and German are the most common second languages. Bilingual signs and menus are fairly common in the heart of the city, but being able to read the Cyrillic alphabet makes life a lot easier. The conference language will be English. Annoyances. It is advisable not step on any form of municipal road or pavement covering (manhole or drain covers) as they might not be fitted securely. Also, look out for icicles that fall down from the roofs in winter. Crime. The average citizen or visitor is no more likely to be a victim of crime in St. Petersburg than in any other large European city. Pickpockets are the main hazard, on Nevskiy prospekt and around the major tourist sites. Avoiding trouble is mostly common sense. Keep your money in a money-belt under your clothing, and don't carry cameras or other valuables in a bag on your back. Most street robberies involve gangs of child-pick-pockets rather than stick-ups or muggings. Sensible precautions include making photocopies of your passport and visa, and noting down traveler's checks and credit card numbers. Electricity. The electrical power in St. Petersburg is 220 V AC at 50 Hz. The power outlets are compatible with Euro-AV connectors (two round pins). The IAA maintains a local Web page for the meeting. Several people took pictures during and around the meeting and made them freely available. Please use the following links to pages with thumbnails. Some thumbnail pages allow downloading of the full size pictures by clicking on them.